Are you the kind of person that waits until crunch time to get the job done? Do you work best under pressure? Most of the time it is arguably alright to wait until the last minute, provided that you are actually good at getting the job done even with so little time. At times, waiting until the end (even if you get the job done) is detrimental to the very essence of the job. Let me explain. This Shabbos is Rosh Chodesh Elul. Elul is a month of preparation for Rosh Hashanah and the days of Awe. G-d, in His mercy, gave us an entire month to prepare for Rosh Hashanah so we do not show up in the King’s palace in our peasant clothing. But, as we say in Yiddish, vus far a punim hut es (what kind of appearance does it have) when you show up every year and start getting your act together just in preparation for Rosh Hashanah? Are we being genuine? The short answer is yes. Every soul yearns for profound spiritual and divine connection all the time. But the challenges of life impede us from being super conscious of that desire. When Rosh Hashanah is on the horizon, we begin to become inspired and our soul breaks free from its confines and wants that connection again. So, the real question is: when our soul is awake, do we respond genuinely to that inner, burning yearning for connection? But, if we do not wait until crunch time (the month of preparation) and begin preparing ourselves before the actual start of the month of Elul (this Shabbat), then we are actually showing that our desire to get our act together is who we really are, even before our soul begins to stir. So what are we waiting for? Let's have an inspiring month. Last week I had one of the most miserable days of my life. Ok that was a bit dramatic. Nothing terrible actually happened that day, but it was Tisha B'Av the 9th of Av, a fast day, the day we commemorate the destruction of the Holy Bais Hamikdash (Temple/Sanctuary) in Jerusalem as well as other tragic events that occurred on this day throughout history. Now, I am not a good faster, but this year the misery was on a totally new plane. Not to make this article all about me (I'm getting somewhere this, hang tight), but I was thinking to myself in my misery; I didn't do much praying (except my obligatory prayers), I didn't do any studying, I kind of just prayed for the clock to move faster and awaited the arrival of 9:19 PM when I could start my recovery, what possible lesson is there in this for me? The next day after I recovered somewhat from the fast and my brain was functioning again, I realized perhaps the message. I need food! I can't survive without food! And when I don't eat food, my whole life, my productivity falls apart. How humbling a thought that is. But why indeed am I and you so dependent on food? The answer lies in a verse in this weeks Torah portion "not by bread alone does many live, but by the word of G-d". Here is how the Baal Shem Tov explains this. Why is it that a human being is sustained from food? Being alive means that your soul is in your body and hasn't left you. (When the soul leaves the body, the body is no longer alive.) So why should physical food keep the soul and body together, or better yet how can that physical food keep the soul and body together. The aforementioned verse answers this. It's not the bread that sustains us, it's the word of G-d that is in the food. It is the spark of G-dliness that is in the food that is the actual source of sustenance, the physical food is just the packaging. When we eat food we draw the G-dliness from it into our body, our soul is nourished and the body is thus sustained in life. And when we don't eat we aren't sustained and we begin to fall apart. Often times we take it for granted, but try going for a day without food and very quickly we are reminded that there is more to life than food - there is the word of G-d (in the food). The above facebook post led to a conversation about Jewish unity, disagreements in Judaism and more. My take on it was that while we may disagree, we are one family and can argue our points respectfully. By Hashgocha Protis, divine providence, there is a Midrash that tells a story that happened when Rabban Gamliel (an Isralite), R. Yehoshua (a Levite), R. Elazar (a Cohen) and R. Akiva (a Convert Family) went to visit Rome. While there, they discussed that G-d is not like a human ruler: when a human makes a rule he expects his subjects to follow it but he does not necessarily follow it. However, when G-d makes a rule, He follows it as well. Hearing this, a Heretic disagreed: Doesn't G-d carry by makeing the rain fall on Shabbos just like during the week? The Rabbis responded that everyone is allowed to carry within their own domain. Since the entire world belongs to G-d, it is His domain and He can move the rain without violating the law of carrying in a public space. The Midrash tells us the names of the Rabbis because they all agreed to this response (a rarity) even though they were each from a different "class" of Jews; from the Kohen to the convert. To put a twist to the midrash; while G-d may own the world, how can He make it rain in the domains of unique individuals? To which the Rabbis responded: Although to us, mere mortals, we are all different and may have different opinions, we all serve the same G-d who blesses us (with rain), each according to his unique needs, but with equal love as we are all the same to Him. G-d loves us all. 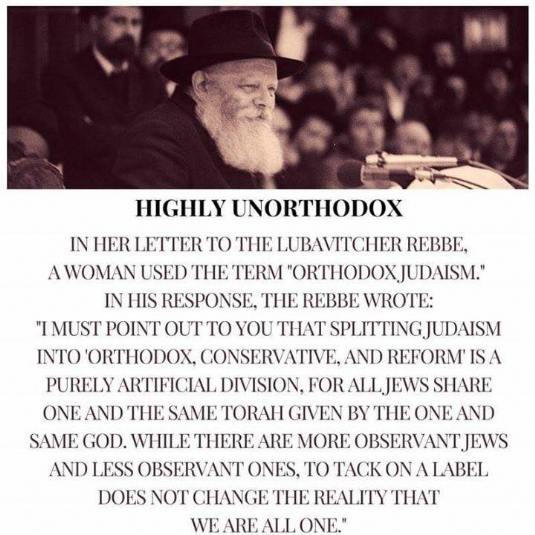 We can have disagreements and respect our unique differences, as long as we keep in mind that we are one people, one family, with one Torah. Every community, family and organization (political, religious, companies etc.) wants there to be unity. Unity is an important ingredient that protects the fabric and the spirit from degrading or losing its way. The book of Devarim, Deuteronomy, is set as the last book of the Torah. The book prepares the Jewish people to take the next step to develop as a nation and prepare to enter the Land of Israel. Moses encourages the Jewish people to ensure that they are unified as that will guarantee success and keep the fabric of the nation wholesome. There is unity that is self-serving; if we both have a common goal we can unite to ensure that goal, but when our goals differ that oneness disappears. There is another type of unity that is internal and real, an expression of the same core identity. This unity can be expressed even when we have different goals. It is noticed in the tone of the conversation and the respect shown to the opposing viewpoint. We are days away from Tisha b'Av, the ninth day of the Jewish month of Av, the anniversary of the destruction of the Holy Temple. The cause of the destruction was baseless hatred and the antidote is baseless love. Have a lovely Shabbos and an easy fast. Life is a journey. Many a time we think we have come to a standstill, a place to camp, a "rest area". Although we use the opportunity to take a break and rest, we still must journey onward and forward. Our goal is to constantly gain and grow from every experience. Even when we hit a low point, a challenge, know that that too will assist in our growth. In this week's Torah portion, the term used to describe the travels and encampments of the Jews from Egypt to the Promised Land is journeys. These journeys include times when they did not "do the right thing", times they challenged G-d and times they challenged Moses. Those moments were also called journeys; they were part of the growth process needed to reach the Promised Land. Personally, as Harford Chabad grows and expands its journey, we come across challenges. However, knowing that those challenges are just growing pains to ensure a successful journey to the "promised land", a space for spiritual engagement in Harford County, makes the journey easier. I hope that knowing this will help you through your "growing pains".